Welcome back to Finance Fridays after our Christmas break. Last time we were looking at winter holiday cover for anyone thinking of going skiing or other snow based activity holidays. This week we are looking at the state of your finances after the excesses of Christmas. Twelfth Night has come and gone, the decorations are down and the Christmas cards are in the recycling bin. For many of us though the financial effects of Christmas will be felt for many months with some of us still paying off debts when next Christmas comes along. If you are struggling with how you are going to pay off your debts take a look at these tips. Budget – Note down all of our monthly expenses such as mortgage/rent, utility bills, phone and broadband costs, commuting and food to work out how much spare money you should have at the end of the month. You can now work where the rest of your money is going each month. Use an online budget planner to help you keep track of things. Allocate and save – When you have worked out how much you have left divide the amount left between paying off debts and saving some. You may think it's best to put it all towards paying off the debt but unexpected bills can occur at any time such as car repairs or household breakdowns and if you already have debts you may find it hard to borrow further amounts to pay for these things. Set up direct debits – If your monthly credit card statement comes by post or email it can be very easy to forget about it and miss making the payment due. Make sure the direct debit amount covers at least the minimum amount due otherwise you will not only incur more interest but also be liable for late payment charges. Pay off highest interest rate first – If you have a number of credit cards or other loans it's best to start paying them off one by one starting with the one with the highest interest rate. It may not be the one that carries the most debt but it will be the one racking up the most interest. Check for 0% balance transfer deals – It may be possible to stop the interest on a credit card by switching to a temporary 0% deal. Be careful though as some companies request you pay a balance transfer fee so work out if the interest amount saved would be greater than the fee. Keep a track of your credit score – If you have debts to pay off you may find this can affect your credit score. The problem with this is it can mean that your debts will cost you more in interest as the best rates are reserved for customers with the higher credit scores as they are deemed lower risk. Check out the ways in which you can improve your credit score through sites like ClearScore to secure the best rates. Have you used credit to pay for Christmas presents? Are you worried about paying it off? If you want to join in with this week's Finance Fridays then add your link to the linky below. Any post concerning financial matters is allowed. Full details here. It doesn't have to be published today as you have until 23.55 on Tuesday 10th January 2017 to join in. Great tips, I am completely unorganised and dread to think what we spent over Christmas. Perfectly timed tips! I do need to check out my credit rating. We were frugal this year ... but time will tell when the credit card bills come in! Good tips for paying down any debts. Would hate to be still paying for this Christmas next December. 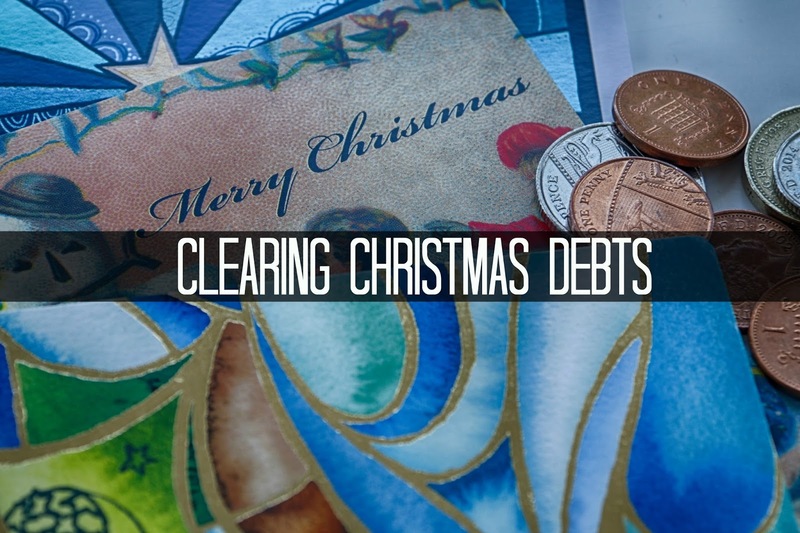 Great tips for those who use debt to cover Christmas, I got into debt a long time ago and thankfully managed to pay it off and have never been in debt since, if you can avoid it that is the way to go. It is a relief to be in January and not owe anything for Christmas spending - I never use debt to fund Christmas although I have in the past when I got into debt so once I was out of it - it was a case of 'never again'! Putting away a bit each month is a great habit to get into. great tips. This year we managed Christmas without restoring to credit. Great tips, I had no clue that your interest rates increase if your credit score is low!